Sergey's Senior Project focused on a long time hobby - birding, and he set out to investigate the impact of urbanization on mimicry in Northern Mockingbirds. You can read more about his fascinating project here. A key component of the Senior Project is to maintain a blog detailing the twelve week research period. Sergey's blog yields lots of information, and a beautiful photo or two-we highly recommend taking a read! 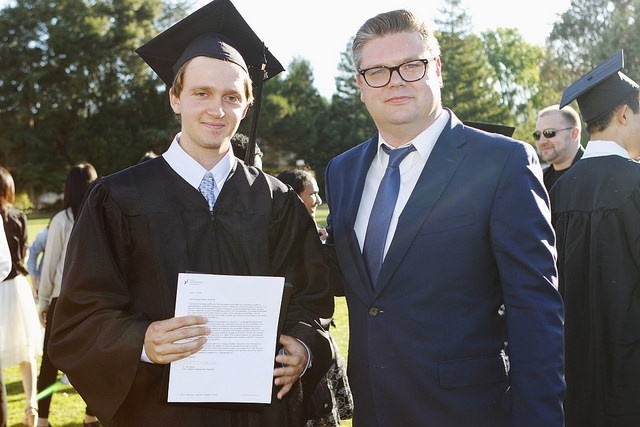 At graduation, Sergey was presented with a letter from Dr. Michael Block and Ms. Olga Block, letting him know that they were thoroughly impressed with his original research, and that he was the recipient of a 2018 Founders' Prize, which includes a $10,000 scholarship. We couldn't be more proud of Sergey, and are excited to hear about his adventures in college next year. We hope he keeps bird watching!